Virtual reality has traditionally been about transporting you to new worlds and making you believe you’re really there. It’s the immersion element, known as “presence” in industry lingo, that makes VR feel like magic. So it was refreshing to see Dragon Front, a new VR game in development for the Oculus Rift, take the approach in an entirely different direction. The game is a riff on popular collectible card games like Blizzard’s Hearthstone where you battle another opponent in strategic combat using playing cards you draw from a virtual deck. What sets Dragon Front apart is its battlefield. Because it was designed from the ground up for VR, the game wraps you in a 360-degree environment where every card you play turns into a real battle animation or spawns a virtual fighter to defend your fortress. The more dedicated CCG players may be reminded of the holographic Dual Disk tech from the Yu-Gi-Oh series that brought to life monsters in a virtual arena. Dragon Front‘s approach is unique for VR because developer High Voltage is not trying to trick your brain into thinking what it’s seeing is real. Instead of making you feel like you’re right there on the battlefield, Dragon Front is about trying to replicate the experience of being in a room with a friend over a real-life table-top game. VR in this case is being used to replicate something familiar instead of conjuring up an entirely new sensation. So think of wearing the Oculus Rift as a way to bring to life the kind of technology you’ve seen in, say, the holographic chess game aboard the Millennium Falcon in Star Wars. We may not be able to bring imaginary creatures and fantasy battlefields to life on our kitchen table quite yet, but we can certainly come close to that feeling by using VR today. Dragon Front doesn’t have a release date set, but the game is already fully fleshed out from its beginnings as a physical card game developed on paper. Using the new Oculus Remote, a streamlined handheld input device shipping with the Rift headset in March, you’re able to look around the battlefield and select objects with the press of a button. Because there’s really just a small handful of inputs, you don’t need a full Xbox One controller to make moves. After just 10 minutes or so of tutorial playing, I was able to grasp the game’s lengthy turn-based combat and try my hand at a real one-on-one fight with another human being in VR. 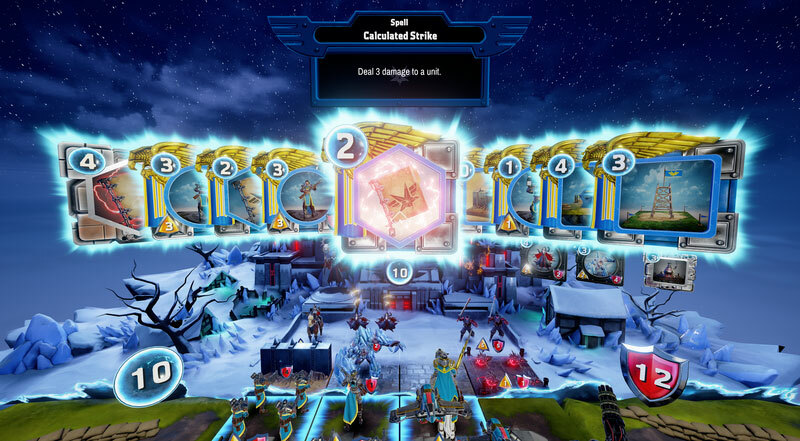 For a card game, Dragon Front was an exhilarating experience that mixes the tense moments of high-level strategy play with the full-body escapism of VR. Yet after a few turns going back and forth, you start to completely forget that you’re even playing a game with a headset on. The competition starts to feel as natural as a physical table-top experience, while the Rift just becomes an interface for your virtual showdown. Dragon Front has a couple fun quirks to amplify that sensation. For one, your opponent’s face shows up as a omnipresent floating mask above their fortress, and it will mirror the direction of their gaze and facial expressions in real time so you can feel as if you’re sitting across the table from the person. Dragon Front also relies on in-game voice chat so you can talk to your opponent as the game progresses. So Dragon Front may not be the most immersive VR title out there or one you could show your parents to convince them of the technology’s potential. But it’s certainly a unique rethinking of the VR approach, one that will most certainly catch on as headsets like the Rift start becoming a more common way to play a wide variety of games and not just first-person experiences. ← Games User Research: What’s Different?